Ximena is genuinely committed to equipping the ministry of the saints, training and empowering the laity to become closer to the living God. She believes that the future of The United Methodist Church depends upon the development of a healthy relationship between the clergy and the laity working together as a team to build Christ’s church and God’s beloved community as inspired by the Holy Spirit. Ximena became a Methodist because of the denomination’s commitment to a social Gospel; you use your voice, as inspired by God’s Word and the Spirit, to speak for the marginalized and voiceless. Ximena became one of the first Certified Lay Ministers (CLM) in the New York Conference in 2009; she currently is Director of Certified Lay Ministry for the Conference. She served as CLM at the First UMC of Shelton from 2009 to 2014. 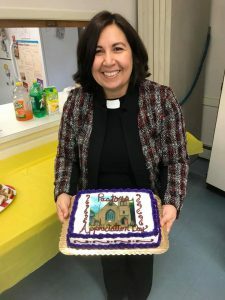 In July 2014 Ximena was appointed at Saint Andrew’s UMC as their pastor, in February 2015 she completed all the requirements from DCOM and became a Licensed Local Pastor. Ximena serves as Chair of the Connectional Ministries Visioning Table for the Conference, serves as a member of the Bishop’s Task Force, and is the chair of the Young Clergy Debt Assistant program. Ximena has been married to Jorge Varas for 25 years and has three children (Moises, 24; Ximenita, 20; Javier, 16). She emigrated with her husband and Moises from Chile in 1995. She lives in Derby, CT.
Ximena enjoys spending time with her family, reading, knitting. Chair of the conference Task Force on Immigration from June 2009 – June 2012, continues to be an active member. Member of Team Vital (which has rolled out Vital Congregations events throughout the Conference for both clergy and laity).